It's not easy being the fat kid. Owen Birnbaum can tell you that. Gym class is the worst, between changing in the locker room and a gym teacher who seems out to get him. Every day Owen looks forward to lunch and the three Oreo cookies he's allowed to have (a concession from his diet that Owen insisted on). So when his Oreo cookies start disappearing from his lunch bag, Owen's got a problem. He's also got a suspect: Mason Ragg, the scary new kid with the scarred face and the switchblade in his sock (or so the rumors say...). Now, what's Owen going to do about it? What I like best about this book is that almost nothing is as it appears. It's a slim book, but it's filled with little twists and turns, nudging the reader to keep going, to find out what it's all about. Ellen Potter keeps up the suspense at just the right pace, revealing little things about Owen's past that start to make more and more sense as the reader puts everything together. This is more than just a story about a fat kid. It's a story about seeing more than what's in front of you, about looking deeper to find out what really matters. I immediately liked Owen as a protagonist. The book's told in the first person and Owen has a smart-but-self-deprecating persona that reminded me of Oliver Watson from I am a Genius of Unspeakable Evil... except not annoying. Other characters in the book are similarly well-developed. Owen's little sister Jeremy (well, her given name is Caitlin, but since she's joined the Girls Who Are Boys club, she goes exclusively by Jeremy), Owen's neighbor and friend Nima, a Tibetan immigrant who runs a food cart and offers Owen Buddhist advice. I'd hand this book to kids who are looking for school stories that delve into more serious subject matter, like Blubber by Judy Blume, Firegirl by Tony Abbott, or maybe Dear Mr. Henshaw by Beverly Cleary (the lunch theft particularly reminded me of this last one!). 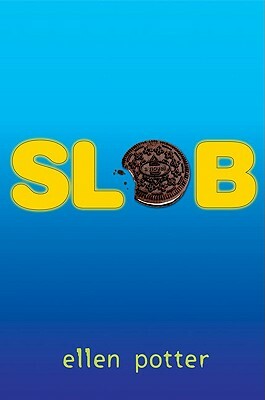 Slob is on shelves now!